Old Town, Lansing, MI — The 28th Annual Michigander will take place July 13-18 on the Sunrise Side with a bicycle tour that showcases Lake Huron, the Iron Belle Trail and the 100th Anniversary of the Michigan State Parks as it travels through the towns of Tawas City, Oscoda, Lupton, Rose City, Higgins Lake, Cadillac, Tustin, Leroy, Reed City and Evart. The Michigander is presented by the Michigan Trails and Greenways Alliance and dubbed as “One of the top ten multi-day rides in America” by Bicycling Magazine. Michigan’s classic cycling vacation offers both a 2-day and 6-day tour. The region along the tour is known for its scenery; sandy beaches, clear lakes, winding rivers and vast tracks of forest. 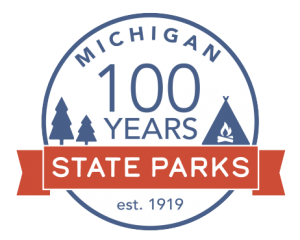 In celebration of the Michigan State Parks’ 100th birthday, riders will enjoy stays in and next to Rifle River Recreation Area, Higgins Lake State Park and William Mitchell State Park. New this year, the tour will focus on the state’s Iron Belle Trail which when complete will use existing trails and new connections to stretch from the far western tip of the Upper Peninsula in Ironwood to Belle Isle in Detroit. 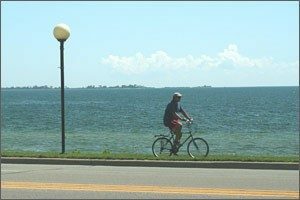 Riders will take pleasure in the scenic views along the Lake Huron shoreline as they travel along the Iron Belle Trail in Iosco County and head west to Higgins Lake. The tour will also feature the widely popular Fred Meijer White Pine Trail as riders head south from Cadillac to Reed City. Riders will also experience a portion of the Pere Marquette Rail Trail on their way back east. Routes along the tour are all on paved trails or paved roads. The 2-Day Michigander is designed to be a casual, easy ride of about 30 miles each day. The 6-day tour moves upwards of 45-55 miles a day, with camp moving to four featured locations. Camping, SAG (support and gear) stops, medical support and daily breakfast and dinner buffets are included during the tour, all made possible by our team of experienced volunteers. “We are proud to continue our partnership with the DNR in helping riders experience the natural beauty of our state park system,” continued Wilson. “We are so fortunate to have world-class trails and parks throughout our state and can’t wait to share the gems in this region with Michigander riders. Participants will enjoy much history along the tour as well, with stops at the historical Lumberman’s Monument, Civilian Conservation Corps Museum and Carl T. Johnson Hunting and Fishing Center. To learn more or register for the Michigander Bicycle Tour visit www.michigander.bike. The Michigan Trails and Greenways Alliance is the statewide voice for non-motorized trail users, helping people build, connect and promote trails for a healthier and more prosperous Michigan. For more information, visit www.michigantrails.org or find us on Facebook under Michigander Bicycle Tour and Michigan Trails.